We put our popular Elem/Late Elem equal-part duets under one cover. All are original compositions. The 8 titles include: Two for the Show, Three Scottish Jigs, The Cricket and the Bullfrog and more! Students benefit from ensemble pieces and have fun while playing together. FJH Duets at Their Best! This book has 7 original pieces by Mary Leaf, Jeanne Costello, Melody Bober and other FJH composers. Perfectly leveled for the early intermediate student, each equal-part duet features excellent ensemble writing where the melody appears in both the secondo and primo parts. Some titles are: Haifa Holiday; Mountain Wildflowers; I Wanna Be a Spy; Moroccan Breeze and others – great selections to program on recitals. We put seven of our popular Intermediate equal-part duets under one cover. Five original duets: Windrider and Bases Loaded! by Melody Bober, Hoedown at Cripple Creek by Kevin Olson, Funtasia in F Minor by Carolyn Miller and Toe-Tappin’ Twins by Claudette Hudelson plus two arrangements: Flower Duet (from Lakme) arranged by Nancy Lau and The Winnsboro Cotton Mill Blues arranged by Jason Sifford make this a very attractive collection. This carefully leveled book offers lots of variety in styles and moods. All can be programmed for performance. 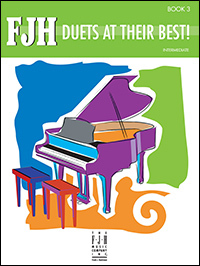 This book presents six duets for your upper level students. There is one arrangement of a classical piece – Hopak (from Mussorgsky’s comic opera Sorochintsy Fair); and five original duets in various styles: latin; rock; lyrical; and even a jazz “spoof” on Hanon exercises. Titles include: Maine Mambo; Rock Talk; Soaring; Hanon Goes Haywire; Rockin’ the Boat; and Hopak.